The deadline is looming for entries for the Free Range Film Festival. It's a two-day festival coming up at the end of July, in Wrenshall, Minnesota. Film festivals are all the rage these days, but what's a "Free Range" film festival? And where is Wrenshall? Wrenshall, Minn. — Answering the second question is easier than the first. Wrenshall is on County Road 4, just off County Road 1, just off Scenic Highway 23, that angles northeast toward Duluth from Interstate 35. Wrenshall is a tiny town whose population must have more than doubled last year when the Free Range Film Festival had its debut. "We didn't know what to expect," says Janaki Fisher-Merritt, one of the organizers. "We didn't know if there'd be twenty people here, or two hundred." They had 120 chairs set up, but that wasn't enough. "People kept coming and coming," says Fisher-Merritt. "So we grabbed some hay bales and threw them up there, and people were sitting really close to the screen." That's right, hay bales. This festival is held in a big red barn, built in 1916. Janaki Fisher-Merritt admits it doesn't look terribly exciting from the outside. But that didn't stop him from buying the barn -- and the house next door -- two years ago. He grew up on an organic farm just down the road, and he really felt he had to buy this barn. "There was a piece of tin missing off the roof," he says. "And if someone bought it and then didn't fix that, I know barns without roofs just go downhill in a hurry." His friend, Mike Scholtz, calls it "four stories of fun." Scholtz is an instigator of the festival who works for a Duluth advertising agency. "It's like they built it to be a multiplex theater someday," says Scholtz. "Because there's a basement, and we could put a screen down there, there's this main level where they had the horses, we've got a screen there, and then upstairs there's a theater with a balcony." The basement door is screwed shut and the retaining walls outside the door are leaning in. "There's some structural issues, that aren't major, but really need to be attended to soon," says Fisher-Merritt. The group admits with some laughter that they haven't made any money yet. But if they did, they'd use it to fix up the barn. Last year they showed 35 films - about half the entries. Entries came from all over Minnesota - and Ohio - and Germany. One screening was devoted to films two minutes or shorter. Up a sturdy set of stairs, the hayloft is warm and sweet-smelling. The open door at one end lets in enough light to show the skeleton of the building -- the ribs running along each side, like indoor buttresses. The roof is 30 feet above the floor. "You can see it's just beautiful," says Fisher-Merritt. "It's like a cathedral almost, to me." This is the theatre. The screen is made from the plain white back of a billboard. Rows of school cafeteria chairs face the screen. The center aisle is marked with two rows of lights running along the wooden floor. 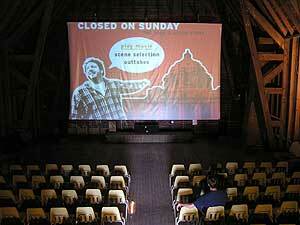 "We tried to make it look as much like a movie theatre, without ruining the basic barn-ness of it," says Scholtz. These three friends still get excited, thinking about the more than 200 people who came for the first film festival last year. "I don't know if they were from Duluth, the Twin Cities, or right around here," says Fisher-Merritt. "You know, there were quite a few beat-up pick-up trucks out here, and I don't know where they came from." Some of Scholtz's favorite audience members were the high school students from Wrenshall. "They were just overjoyed to find something to do in Wrenshall on a Friday and Saturday night," he says. Valerie Coit, a team member who works at a non-profit organization in Wisconsin, remembers getting really excited when somebody pulled in with a Mercedes convertible. "And we knew they weren't anybody we knew!" she laughs. The friends call their festival a "farm-fresh alternative to stale cinema." They plan to show about ten hours of independent films on July 29th and 30th. Deadline for entries is June 1st, but the friends say if they check their mailbox a few days later they'll be happy to see more entries.